As much as I'm pro-EU, I struggle to identify myself as a European. I'm Italian first and foremost. Sure there are common roots and there are common values, but our culture isn't quite the same as french culture, german culture, spanish culture, etc. It depends on the scale that I'm talking about. On a global scale i'm european. On a european scale: I'm german. On a german scale: I'm a franconian (not bavarian). And so on. But overall yeah, of course I'm a european. I'm English, but also European. Because of Brexit, I now have to fight to keep my EU citizenship. I studied abroad through Erasmus and went on a Interrail trip through most of Western Europe - both results of the European Union. That alone has made me a big fan of the union. I really don't identify with my country anymore - If you'd asked me about 10-15 years ago what I would say best represented my country, I would've said: tolerance, altruism and solidarity. Today it's greed, racism and xenophobia. Our welfare state is being dismantled and sabotaged, public infrastructure is being sold of to the highest bidder, Muslims are heavily discriminated against and the poor and unemployed are treated only with suspicion. I'm strongly considering moving to Germany or Norway once my thesis is done. Depends on the context really. If I talk to fellow Dutch people, I'm from X city/region. With most other Europeans I'm from the Netherlands, but with Europeans from the eastern states I'm a 1st generation migrant from those parts as well. Among people outside of Europe, I'll still say I'm Dutch for simplicity's sake. Benelux has always been mostly an economic union rather than a cultural exchange like the EU. I've never met a Luxembourger in my life, but I do enjoy a gentle ribbing with my Belgian neighbors. But that's just that: being from a neighboring country. And part linguistic similarity with Flemish folks. There is a degree of flexible identification with Europe but it is secondary to my nationality, which in itself is also not that rigid. At the same time, it isn't necessarily a matter of EU countries only either. People from Turkey, Russia, Moldova, Ukraine, etc. are also included in the hot mess that is Europe. Many of them are neighbors of mine in daily life. We're all distant brothers and sisters despite not being under a single geopolitical banner and even if our countries' leaders try to convince us otherwise. I really don't identify with my country anymore - If you'd asked me about 10-15 years ago what I would say best represented my country, I would've said: tolerance, altruism and solidarity. Today it's greed, racism and xenophobia. Our welfare state is being dismantled and sabotaged, public infrastructure is being sold of to the highest bidder, Muslims are heavily discriminated against and the poor and the unemployed are treated only with suspicion. Strongly considering moving to Germany or Norway once my thesis is done. Does Interrail give you discounts based on being EU citizen? Good way of encouraging young people to get out there. Way beyond that. It's accepted now. And kinda fun. Can't be mad at curious people for long. I grew up in West Berlin. I'll never get this out of my head I think. I'm a European though, too. And a German. I don't see a reason not to be all of it. Adding a wrinkle to this topic: I've heard that it's a common sentiment of the British to not consider themselves European. Is this an Islander thing? It's an older British/English people thing. England has always kind of considered themselves special or above everyone else. For instance, when the Euro was introduced they were one of the few that wanted absolutely nothing to do with the Euro. And of course the whole Brexit thing was part of this as well. I feel like, me, man. I'm British, but I think of myself more as European than most Brits, but that's probably because I've spent most of my adult life living in the Netherlands (still do), and make frequent visits to Germany. If you're an EU citizen you pick the Interrail. For non-EU citizens it's Eurorail ticket. Afaik the prices are pretty similar, but don't quote me on that. Can definitely recommend it fam! I have surprisingly always identified quite strongly with the European identity. I think it has a lot to do with the fact that I have lived in numerous countries, quite a few of them EU member states. When you don't really identify strongly with any real "home" country (I moved a lot even when I was a kid, my parents were diplomats), I think this is a good option. I agree with some posters here though that there is lot to improve what does it mean to "feel European". I do hold dual nationalities as well, but don't really consider myself a "real" citizen of either of those countries, having not lived in either for a long time. I'm from the UK, specifically England and I've always considered myself European. I was born while we were part of the EU. Whenever I've travelled to other parts of Europe I've generally felt welcome, found the people to be helpful and tolerant of tourists. I've landed in various gaming communities made up of Europeans from all over and always felt a part of the group. I'll always be European in my mind. I never participated in Erasmus because it was still a too big of a financial effort for a college student from a low income family with another 2 siblings. However because of my work as a consultant I have the opportunity of working in teams with people from all over Europe and in different countries. But even before that, I remember that in I always tried to understand what the EEC was and eventually the EU (when I was a kid the Maastricht Treaty was always on the news and was a very big deal). Taki and another thread about Europe? Do you identify both as a European AND as your own country? I consider myself European. I'm also German but European comes first. Irish and have enjoyed easy travel around mainland Europe. I always refer to myself as Irish, and never as European, though support and enjoy the benefits of EU membership. I guess most European countries have their own local neighbouring allies, with like minded citizenship. As an island and a neighbour of the UK, we probably get frequently mislabed as non-European. I've always felt European more than British. I'm a bit suspicious of national identity, that's all. I like the way Europe has become more peaceful and slightly socially progressive through efforts like the Council of Europe and the EU. I'm proud of our somehow managing not to fall into another catastrophic war, which would sound like a daft thing to be proud of if it weren't for the grim facts of our history. French/European here, though I'm often disappointed that Europe isn't living up to the ideals of the Treaty of Rome. Completely understand the resentment against operating it with such a heavy focus on being an economic union rather than a political and human one. There is no general pro or anti-EU sentiment in one country or another. There will be some difference in percentages, but you'll find people with both opinions everywhere. A lot of rightwing people here in Belgium are very anti-EU, and some extreme left (who feel the EU is a globalisation monster) too. I mean look at how the Brexit vote was a question of mere percentages, and that was a country considered having a strong anti-EU sentiment. In general, I feel a lot of people don't care one way or the other. European elections are experienced as being 'far removed' from people's daily lives for instance, and - at least here in Belgium - not a big thing. It's just an extra election form to color some names or parties on when we're having our national elections anyway. A politician moving to the European level is regarded as a lateral promotion to sideline them or end their carreer in a friendly manner. I feel a lot of people experience the benefits of being in the EU (free movement and the economic benefits of that), without really caring about the political side of it. It's only when you take them away they'll understand the importance, like those pro-Brexit people living on the continent or spending their winters in Spain and Portugal suddenly realising it won't be that easy anymore when a hard Brexit hits. I'm first and foremost Welsh, then British, then European. That won't change as it's all I've known over my 35 years. 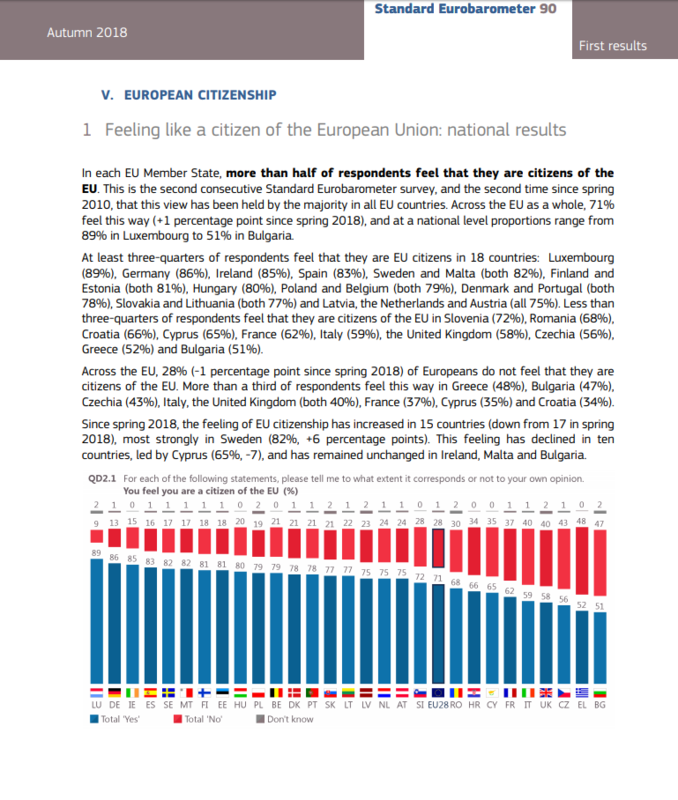 Here is a snip of the last Euro Barometer survey OP. It should give you some clarification. The rest of the survey result can be found here. I'm British and identify as a European... I'm also 34 and will be a remainer till I die. However, I think this captures the older generations feelings - my cousins (millennials) who have traveled and lived outside of Hungary hold a more open view and I think may even want to separate themselves from the identity Hungary as a country has latched onto... considering the country is experiencing a population decline over the years because young people are moving elsewhere in Europe (or even Australia), I think a pan-European sentitment could potentially change with the new generation...(depending on how successful Hungary's current attempts at indoctrinating the youth are). There is no european identity. More European than Belgium. But that is what you get living and working right next to all the EU buildings. Nice I was trying to find this before for the thread. 1. Since studying is never free, you're still technically paying for studying abroad, just not anything extra. 2. You obviously still have to arrange everything there like housing, travel, etc. It's a super nice thing that keeps getting bigger and definitely helps to forge a "european identity" in some ways, but across a generation it's still a minority that gets to be able to experiment it, to give some perspective for a single year you have 2.6M students in France, in 30y around 610k were able to experiment Erasmus. As for the original question, identity is always multi faceted, you start from yourself and gradually go up from there, I'm myself, I identify as a member of my family (thus my name), I then have roots which are defined by a town/region (eg. extended family past and present, for me Bretagne) above that is the state that defines my nationality (I'm french) and above there's this shaky notion of European that we're trying to build up on. It's a long process and there's a lot of things to work on but I can definitely see a foreseeable future in a few decades where "European" will be an even stronger sentiment shared accross countries there. I'm Dutch, born and raised, and yes I would identfiy myself as Dutch/European, when I speak with other Europeans I identfiy more as Dutch, but with my international friends I'm more European. As for the Benelux bit, yeah we do joke about eachother but in the end I (and I think most Dutch people) feel really close to the Belgians, and especially the Flemish. Our ties with Luxembourg are more historic ties though. As a Flemish Belgian (identify as Belgian), i agree about the Benelux-situation. We love laughing with Dutch people, but we actually really like you guys. You're the only country in the world that can understand most of what we are saying. Nobody cares about Luxembourgh though. I'm sure people born in the 70s have a "western" or "eastern" European identity shaped by the Iron Curtain. It might still be here, though it probably evolved in something more diffuse. It's easier to congregate around an idea when you have a clear opposite in front of you. I was born in Italy and raised in Germany. I identify myself as a German, as an Italian, as an European and as a citizen of the European Union. British and European and sad. I love Europe, but I'd never identify as an European. I'm Swedish..
Dutch first, but definitely European as well. My work in academia and the international environment that comes along with that really strengthened my appreciation for the EU and the ease to travel and work in another EU country that it brings. It brought me many friends from all over Europe. I'm born in Canada to Lebanese parents but I grew up in Sweden. Do I feel European? I guess I feel a bit of everything. To an extent. I feel like a European and a Brit the same way I feel both like a Brit and an Englishman. It's the most peculiar thing to me, with Brexit, is that I'm essentially losing a citizenship. I was a citizen of Europe and now, through no action or choice of my own, I will be rescinding that citizenship. My current partner is Irish so that may change one day though. Irish European. And I don't think it has anything to do with an "islander" mentality - Irish support for the EU is very strong. We studied this in college (sociology). The teacher asked us to mark what we identified with the most. Half the class said Galician, half said Spanish, a few citizens of the world and almost no European. Keep in mind that we could only pick one. I'd have considered myself all the four options in one way or the other. European and believer in the union.